The magical story of an Australian boy’s passion for flight and his journey to compete in the world Paper Plane Championships flies onto the silver screen this autumn, when PAPER PLANES is released in cinemas nationwide and on Digital HD on 23rd October, courtesy of Lionsgate UK. Eleven-year-old Dylan (Ed Oxenbould – The Visit, Alexander and the Terrible, Horrible, No Good, Very Bad Day) is getting a hard time from a school bully, whilst his father (Sam Worthington - Avatar, Clash of the Titans) is at home grieving over the death of Dylan's mother. 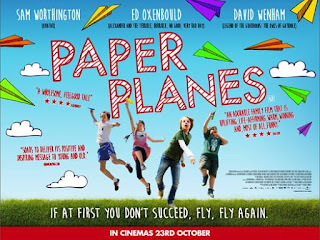 When a regional paper plane tournament is announced at Dylan’s primary school, he soon discovers his natural talent for creating the ultimate paper plane. During a whirlwind adventure that takes him all the way to Japan for the world championships, Dylan meets the junior Japanese champion, Kimi, and they develop a close bond challenging each other to build the most beautiful paper plane ever made. Inspired by his carefree ex fighter-pilot grandfather and a kite hawk he feeds on his way to school, Dylan learns that if at first you don't succeed, fly, fly again! 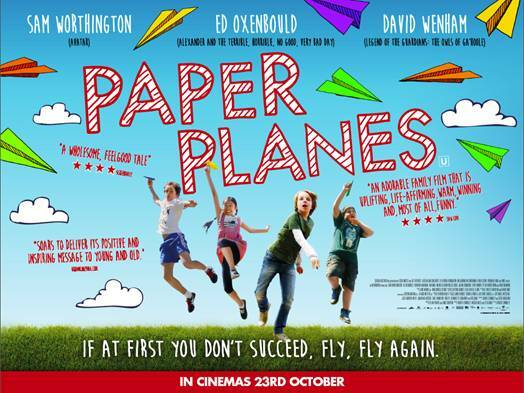 Featuring an international cast including David Wenham (Lord of the Rings trilogy, Legend of the Guardians: The Owls of Ga’Hoole) and directed by one of Australia’s leading filmmakers Robert Connolly, PAPER PLANES is the delightful must-see movie this half-term that delivers powerful lessons in friendship, kindness and hard work. Whatever happened to our favourite action heroes?